This is for little Miss E, mentioned several posts below. It's a hug from a pseudo-grandma for a wee little thing. 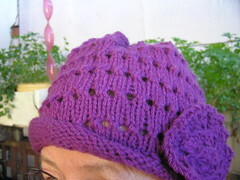 Actually, it's knitted in a six month size. I've never seen her, so have no idea how big she is. She lives where winter is cold, so I imagine there'll be some time when it fits her and is useful. 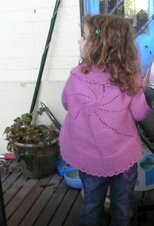 The pattern came from a Moda Impact 7 book which has quite a few easy and quick things for babies. Wool is from Bendigo Mills and is machine washable. I had great trouble finding buttons. The jumper has been finished for over a week. This afternoon I went to L**craft in Sydney as I couldn't find anything I liked or was suitable. Next time I'll save all the time and effort and go to the button shop at Newtown first off. Clicking on the top picture will enlarge it and show button detail Cute, but just not what I had in mind. They don't keep a range of children's buttons any more. Everything is supposedly sorted by colour. I found one button I liked but it was the only button in the tube. An assistant moved my basket which was not in anyone's way. I was the only person looking for buttons. I can understand that. Either a security camera or a fluorescent light tube was emitting a very annoying buzz. Constantly. She asked what colour I wanted and I told her aqua. Out came all the greens. No. Now one thing I can do is colour match thread, buttons, ribbon exactly without having a sample to work from. I told her aqua again so she kept showing me baby blue, sky blue and became annoyed when I turned them all down. "You should have brought the garment in so I could see what colour you are wanting!" I finally said that if they had anything in the colour, I was quite capable of matching it myself but that the last several times I had been there for buttons, the range which looks extensive is actually poor. I wasn't rude but had had enough. Also lack of sleep and some other problems. I poked around and found these buttons. They are not what I really wanted but will do. She was about as much help as Sp**tlight assistants. Now I know they get peanuts for money and don't seem motivated to help, but I hoped L**craft would have been better. This photo has the jumper resting on one of the many jacaranda trees here. The tree was in deep shade, so it's hard to see. The only way I could get it to stay safely while I took the photo was to drape it over the end of the branch. It doesn't really bulge as it appears to. LOL. Actually, I just managed to get the photo taken and grab the jumper before it slid from third floor level to ground below. One thing I do have which is quite handy sometimes, is quick reflexes. I'll pack them up and get them off tomorrow or Thursday. I've included the socks shown down the page and and something for the mum and grandmother too. I understand the buttons were not what you had in mind but they are cute and seem to blend well with the jumper! I find L** much worse than S** here in my neck of the woods - both for range and especially service! And the lighting [mercury vapour lamps] is terrible!